The First World War broke out just as Ship-of-the-line Ensign Thierry d’Argenlieu was serving in the Adriatic on the destroyer Dehorter, on patrol in the fight against enemy submarines. In June 1916, he joined the torpedo-armed aviso D’Iberville in the Mediterranean. In this commerce raiding operation, the long waiting periods were interspersed with moments of anguish involved in the hunt for the Central Powers’ unseen U-Boote. As skipper of the patrol boat La Tourterelle in spring 1918, he commanded his first ship in wartime. Following his vocation, he joined the Carmelite Order in 1921 but the war tore him away from contemplation. Called up as a reserve officer and taken prisoner in June 1940, he escaped and headed to London. 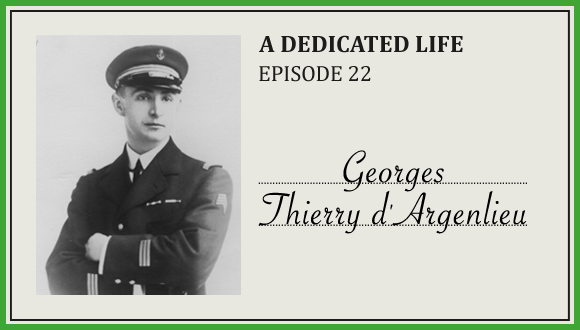 A close associate of General de Gaulle, he was made Chief of Staff of the Free French Naval Forces and became the first Chancellor of the Order of the Liberation. Despite being wounded in front of Dakar in September 1940, he took part in the Gabon operations. He then undertook several political and diplomatic missions with the Allies. By now an admiral, he returned to the Carmelite Order in 1958, for good this time.